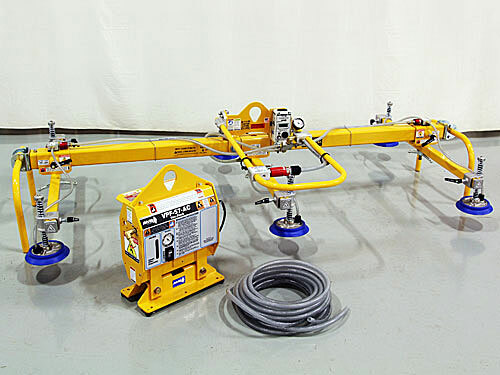 Remote vacuum lifting systems are typically required for customers who need to mount vacuum attachments on a pick-and-place machine or manipulator where weight must be minimized at the attachment head, or if there is not enough headroom to accommodate a complete vacuum lifter. 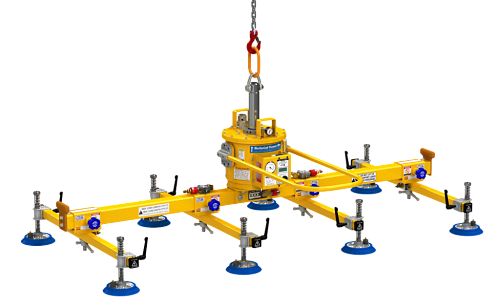 Lifting beams with remote vacuum stations are usually designed with a specific task in mind and are not meant to replace traditional operator controlled vacuum lifters. Note: Remote vacuum lifting systems pose a potential safety problem. Operators must be extremely careful monitoring the supply hose that connects to the lifting frame because if vacuum is lost as a result from being disconnected or cut the load would immediately drop since the vacuum reservoir and check valve are located at the remote station, not on the frame or hose leading to it. This is the main reason why lifting frames without built-in vacuum stations have limited use. Contact ANVER for more information regarding custom vacuum lifting frames and vacuum generators.